For potty-trained children who have turned 3 by September 30th. Our innovative curriculum focuses on adjusting to school. Primary attention is given to parent/child separation, age-appropriate social interaction, safety at school, following directions and fundamental daily living skills. 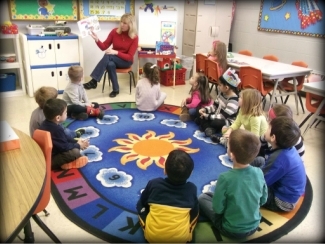 Academically, we expose children to basic concepts of literature-based thematic units. These units incorporate music and movement as well as skills through 'hands-on' activities that allow children to experiment, explore and pretend in a meaningful and productive way. Other basic goals are to introduce and have the children become proficient with the numbers 1-10 and recognize and common shapes & colors. The children also become “young authors” by creating books based on popular literature; such as Brown Bear, Brown Bear Color book and the 10 Black Dots Number book. Our young authors work all year to create a personalized book on their first preschool experience. This book is called "All About Me" and does a great job chronicling their experiences throughout the school year. There are also several interactive programs during the 3's school year. For instance, the Special Persons Program in February is when the children get to invite a “special person” to come to class and there is a Mother's Day Program in May. These programs are always well received because the children show-off their dancing and singing skills. Student-Teacher ratio 9:1. Maximum class size is 16. We offer morning and afternoon classes that meet either two or three times a week according to your selection. The classes meet on either Monday & Wednesday … OR… Tuesday & Thursday. A lot of Parents choose to add Fridays in order to make a three day program. It is possible your child will have a different Friday teacher.